We offer a wide range of heat exchangers and associated products including corrugated tube, shell and tube, scraped surface and plate units. 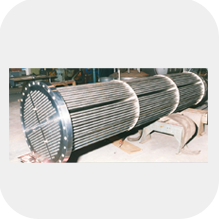 We supply heat exchangers made from durable Cu/Ni, stainless steel, aluminum or other exotic alloys, which are efficient, resilient and maintenance free and thoroughly tested to ensure to meet design specifications and performance expectations. The technology employed in fabrication incorporates extremely high efficiency heat exchange with high pressure and extreme temperature capabilities. 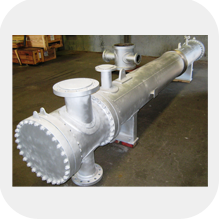 Heat exchangers are for the operating in the Oil & Gas processing industry in applications ranging from gas compression cooling offshore to refinery feed and effluent duties onshore. We supply shell and tube heat exchangers in a wide range of materials ranging from titanium to Low temperature steels. Compared with the normal plate-and-frame heat exchanger, the plate-and-shell type has the advantage of a higher working pressure limit and working temperatures. 2013 © Reliant EXIM & Consulting LLC.